Gate Master did nothing when click on "Cast Town Portal". Matser Healer failed to cast spell after heal party several times. I've noticed just now that normal human knights have Axe available to Grandmaster. It should be Master normally. I assume this is a mistake brought on by trying to give dwarves GM axe regardless of class. Bug with potion recipe registering: The third recipe for Divine Restoration didn't register for me when picking up the Purple+Blue potion and mixing it with the Orange+Yellow potion, but it did work when I picked the Orange+Yellow and mixed it with the Purlpe+Blue. I believe this should work regardless of sequence - when doing the first one I did receive the potion, but not the new recipe entry. Same goes for the Cure Paralysis alternate recipe - which leads me to assume it's a problem with all of them. Higher level alchemy shops should have a chances of carrying level 4 or even level 5 reagents - currently I think they never do. Maybe not level 5 to preserve their scarcity, but making level 4 an option with a small percentage of appearing would definitely be nice! Also, I believe the new recipes aren't appearing at stores (not sure about random loot). Goblin scaling with bolster is still a big problem. For a 200 lvl party they have 1167 hp and 9d57 damage - much higher than many initially stronger monsters. Peasants in Deyja get violent and attack you, but don't have an attack animation (this never happened before, they just ran). Sometimes when right-clicking a monster to identify it, the monster portrait window just goes blank and stays that way for some time. And most importantly - since the latest update I've often been getting an internal error message saying "Might and Magic VIII has detected an internal error and will be forced to close. Would you like us to autosave your game before closing?" - said autosave not creating another save file. Last edited by Xfing on Feb 23 2019, 12:20, edited 9 times in total. Reapply latest update, please. I've missed one file there. Also, goblins should be bolstered in normal way now, and peasants without animation won't try to attack player. Thing is, game does not support per-player Protection from Magic buff. Only way, except digging .exe, is to buff whole party. Xfing wrote: I've noticed just now that normal human knights have Axe available to Grandmaster. It should be Master normally. I assume this is a mistake brought on by trying to give dwarves GM axe regardless of class. Minotaurs-knights too. I think about keeping this change. Ok, forget about it then. I'll think of a new idea for a potion with the existing formulas. I thought Protection from Magic would be available, but now it seems apparent that only spells that initially affect one character and the entire party only at a certain level of mastery can be applied to potions - one exception being Haste, but Haste doesn't actually seem to work on potions (unless it was fixed by Grayface or you). Hammerhands is too situational and not very useful, so maybe Pain Reflection? That's a pretty badass spell and such a potion could help out parties with no Dark Magic to even the odds a little. Rodril wrote: Minotaurs-knights too. I think about keeping this change. Yes, but if human knights have GM axe too, there is not much point in running other races, since Knights can GM all relevant weapon choices in addition to GM Armsmaster. Mino and Dwarf knights sure, but I think human knights should be restricted to Master to let those other races shine. Last edited by Xfing on Feb 23 2019, 16:41, edited 1 time in total. Xfing wrote: BTW what does it mean that reputation in MM7 is not important "due to the mirrored paths"? Reputation in MM7 is region-locked, and it didnt' seem to work at all in MM8. Losing 25 points in Tatalia is nothing, you can just go donate at the temple there and bring yourself back to neutral. The Mirrored Paths refer to the effect of a mirror - if you look into a mirror, the left and right will be flipped. Your left hand becomes your right hand in the mirror and vice-versa. When I refer to the Mirrored Paths, I refer to the Good and Evil paths of MM7, which have essentially the same effect. Except those are mirrored top-to-bottom too, since you know - Celeste and Pits? Reputation in the Merge will be fixed eventually I presume, and in MM7 you could only learn GM Dark Magic while on the Evil Path,... What I am trying to say - reputation in MM7 wasn't as big as in MM6, because the Path of Light or Dark dictated things. So I guess now it depends on if the mastery in MM6 portion does still depend on reputation, amidst other things, and if Rodril's final reputation will be map-based. To install add everything from the archive to Icons.lod with MMArchive (it will replace and save everything right away). Don't forget to back up. This is insanely awesome and great. 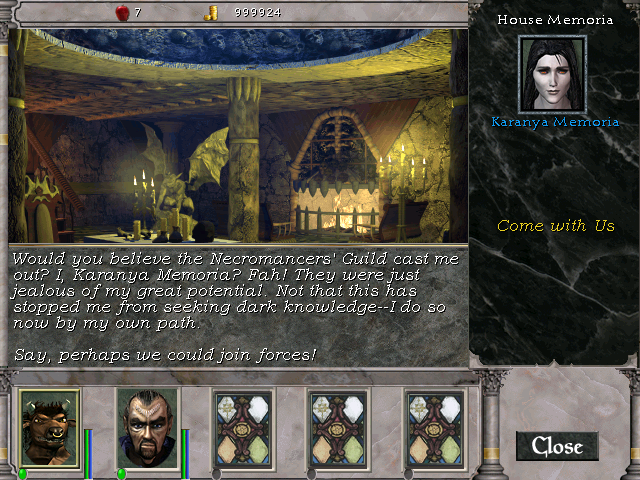 I would've never thought of using squares for the characters like that, and yet it is perfect for a MM6 styled UI! Puts my decorative ornamental circles quite a few pages back to shame. Will you enable us to use it in the Merge? Will you do more than MM6-styled one? If this is your work on a MM6-styled one, I would love to see you do another just to see what you would do with it! Daedros wrote: Bracada Desert, Celeste and Castle Lambent being permanently hostile after stealing the Tapestry, even after a map reset, is preventing me from continuing the main questline. I just killed Xenofex, yet can't turn in the quest to Resurrectra due to the Throneroom in Castle Lambent being locked. Phobos wrote: A small cosmetic bug with rings: Some MM6 rings are aligned too much to the right in the ring slots. This concerns Scarab Ring, Ethereal Ring, Witch Ring, Blessed Ring, Precious Ring, Fine Ring, Exquisite Ring, and to a smaller degree, Sparkling Ring and Valuable Ring. Curiously, Lunar Ring seems perfectly aligned. Klasiant wrote: Noblebone Bow (with explosive impact) will not be repaired in any weapons store in Jadame. He simply assures me it isn't broken. (Goddamn salesmen) Might be that Antagarich or Enroth weaponsmiths might be more helpful, but I have not gotten around to visit any yet. I have more than once fallen through geometry in different caverns. Tunnels to Eofol in Antagarich and the dragon caves in Garrote Gorge in Jadame immediately springs to mind. A few times the Great Wyrm leader of the dragons in Garrot Gorge has refused to speak with me, even when I have little or no interaction with the dragons. When I enter his cave he simply refuses to give me any dialogue options. I know this is not quite as good as a whole new interface, but is definitely a good compromise and already nice eye candy. With some patience, we might get full UI designs, as the MM6-style UI author has shown! Phobos wrote: "Mekorig's Hammer" has some wrong attributes. It doesn't give +75 Might or reduce Air Resistance by 50 like it should - instead, it raises Speed and Accuracy. Staff and Unarmed seem to work incorrectly together. I have a character with GM Staff (so it should work with Unarmed), plus Expert Unarmed and Expert Armsmaster. Adding skill to Staff and Armsmaster has the intended effects, but adding skill to Unarmed increases neither attack bonus nor damage with the staff. Maybe having Armsmaster in the equation has this result? NPCs seem to count quest NPC's when it comes to party size, so you can't hire four of them if Charles Quixote or the Golem is around, for example. You can, however, hire four and then get as many quest NPCs as possible. I suppose it should work both ways? Xfing wrote: I think all available uniques should be looked at. Many from MM6 and MM7 don't perform as advertised at all, granting either just part of the bonuses they say they grant, none of them, or completely different ones. Xfing wrote: Bug with potion recipe registering: The third recipe for Divine Restoration didn't register for me when picking up the Purple+Blue potion and mixing it with the Orange+Yellow potion, but it did work when I picked the Orange+Yellow and mixed it with the Purlpe+Blue. I believe this should work regardless of sequence - when doing the first one I did receive the potion, but not the new recipe entry. Same goes for the Cure Paralysis alternate recipe - which leads me to assume it's a problem with all of them. These were added to the Bug Tracker. Rodril knows / fixed / reacted to the other stuff you have mentioned. Xfing wrote: Yes, but if human knights have GM axe too, there is not much point in running other races, since Knights can GM all relevant weapon choices in addition to GM Armsmaster. Mino and Dwarf knights sure, but I think human knights should be restricted to Master to let those other races shine. Sh*t guys, I just realized that one of the main story characters who is a grandmaster of Dark Magic is actually also a Master Necromancer! Archibald Ironfist. He even teaches grandmaster Dark Magic, and yet he is no Liche! That realization just shot through my head. Last edited by Templayer on Feb 23 2019, 19:54, edited 1 time in total. BTW, after reapplying the latest patch, I found two Splitters. In the same room - the Dragon Caves hoard. Something is still off with the artifacts. As for the UIs - they would sure be a cool thing to have! But in my opinion independently character-customizable inventory grid colors as well as glove/amulet/ring slots would also be a nice feature, regardless of the UI currently displaying. Oh, and there's five of them, not four - I didn't count the one from MM7 before choosing your path! Last edited by Xfing on Feb 23 2019, 17:29, edited 1 time in total. I wanted to make that custom UI because some or many people don't really like a theme or layout of the default UI in 8. That'd be interesting if you were to include the UI within the mod, if you feel like it deserves it. I will try to finish that one when I'll have time first, then might make some more with 7. I am hoping to sort things out and post GIMP project files so that if someone wishes to modify it they'd have source files. It probably can be made as an optional thing with LodMerge or something like that, haven't really looked into this yet. The square borders were a forced solution since every portrait contains the green background and I haven't really tested if it's possible to add transparency to them. I was trying at first to overlay the backgrounds with some other UI elements (to get that round border for portraits) but they were either on not appropriate layers or not supporting transparency. Now somehow it feels fitting and special, so it will probably stay that way. The square borders might be also suitable for portraits from IX, if it is possible to extract them, I am not sure if they have similar states, but they are pretty decent in my opinion. Honestly portraits or even FMVs from World of Xeen might look interesting as well. So much potential! Thanks everyone for your kind words, that mod really brings the series back to life. Last edited by Vinevi on Feb 23 2019, 18:55, edited 2 times in total. Some bosses still don't get bolstered, such as Zog (still called that instead of Grognard it seems) who keeps 40 hp. Enrothian peasants from New Sorpigal do get bolstered, while otehr peasants don't seem to. And there's still no way to promote Necromancers to Master Necromancers What a shame! Last edited by Xfing on Feb 23 2019, 19:57, edited 2 times in total. Xfing wrote: Some bosses still don't get bolstered, such as Zog who keeps 40 hp. 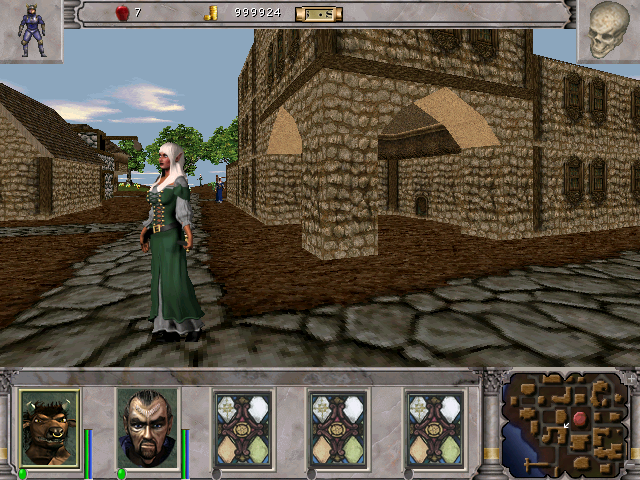 Enrothian peasants from New Sorpigal do get bolstered, while otehr peasants don't seem to. Added to the Bug Tracker. I definitely agree that Necromancers should be promotable to Master Necromancers. Rodril: this one should be removed. I did not get response if problem was solved, personally I've finished that quest in my last playthrough, probably bug was fixed in previous updates. Kliff: I forget, was Goblinwatch and the Abandoned Temple in New Sorpigal always supposed to have a few very out-of-depth items available in chests at the end? Like, every time I've done them I've gotten about three, two from Goblinwatch and one from the Temple - this latest time I snagged a set of Siertal Chainmail from the Temple, in fact. Was this always the case in base M&M6? Phobos: The items at the very end are meant to be of good quality, as a reward. I don't know what item level they are meant to be though. Templayer: Might be an actual bug, but maybe it isn't. A check might be in order. We've got dwarves, but we seem to be missing their voice files! They're using the four Knight voice files at the moment. I've noticed another oddity. I'm wrapping up Jadame (after starting on Enroth for 15 levels, and jotting over to Antagarich for Unarmed and Dodge training). I altered mapstats.txt to cause all maps except the dragon caves to respawn every 6 months -- except ones that are set to not respawn, etc. I'm finding that chests in Jadame that once gave a guaranteed artifact now do not grant an artifact. I open every chest repeatedly until nothing else appears, ala Greyface fixchests. I have not yet collected every MM8 artifact. In my most recent round of resets, I did receive artifacts from the hidden chests in Alvar and Ravenshore. Immediately following, I opened the hidden chest in Ironsand and the standard chest in the Lava Tunnel. No artifacts in either -- let alone the 2 that are supposed to be in the Lava Tunnel chest. I also found none in the Ravage Roaming crate in the Ogre Fortress outside. I am also currently save scumming a Ruby Dragon in Ravage Roaming (Echo's maps). Oddly, I am receiving exclusively MM6 artifacts from it (artifacts being found at the normal rate). I did not expect to see MM6 artifacts until I had exhausted the supply of both MM8 and MM7 artifacts. I have not altered Monsters.txt. Rnditems.txt shows a 1 for T6 for all MM6, 7, and 8 artifacts that are in the merge. I received 4 or 5 MM6 artifacts from this Ruby Dragon, while no MM7 or 8, so it doesn't seem to be RNG oddities. Xfing: Yeah, I've also noticed something of a bias in regards to MM6 artifacts dropping more readily once you've found your share of MM7 and MM8 artifacts. I also have no idea what determines this. But as long as you can find every single unique item in the game, I'm happy I guess? I would only prefer that there be some sort of flag that once you possess one copy of the item, it can never spawn again. Of course if you sold it or threw it into the water thereby removing its instance from the game, it could start appearing again, after some time flag was passed (6 months for example). I wonder if something like that would be codable, it would be really fun to have it like this. lightbringer23: I can confirm it's just RNG -- Except for the chests with guaranteed artifacts. Those are still misbehaving. At this point in my game, I'm not worried about it, as I've just about exhausted the MM8 artifacts from going Dragon hunting and clearing Escaton's Crystal. The chest behavior is odd, though. I did find a Noblebone Bow in a chest in Yaardrake's Cave, but I think that was specifically placed. Currently, T6 artifact drops are favoring the few remaining MM8 artifacts I had left. 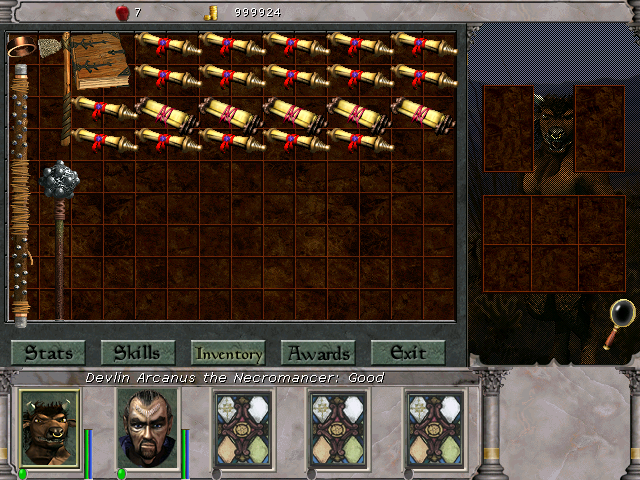 Previous to that, they heavily favored MM7 artifacts. Significant statistical clustering, but completely doable. Found another bug by accident now. The Elven Chainmail (the already identified artifact chainmail from MM7) does not grant its stat or recovery bonuses like it says. Also, not sure if I've mentioned this - but the random weather effects interfere with the permanent snow in the Frozen Highlands. - it's never snowing there permanently, even before the quest is solved. After that some intermittent snow should be OK of course. Both Balthazar Lair and Shadowspire can now train characters regardless of level. In previous games only one training hall could do that - the hardest one to reach. I suggest that Shadowspire be brought back down to 200 and only Balthazar Lair's trainer can train you above that level. Bugs removed from the Bug Tracker. Kliff wrote: We've got dwarves, but we seem to be missing their voice files! They're using the four Knight voice files at the moment. Hey Kliff, the bug you really, REALLY wanted to get rid off has been fixed! BTW, obtaining more MM6 armor artifacts I've noticed that they are both tinted a bit differently. Great idea to differentiate them, though for example with the MM6 chainmails I saw an alternate paint where the red elements on the armor are blue instead. Maybe you could use that too/instead? It would be nice if both chainmails were actually different from their baseline chainmail template, while the untinted one with red accents could be used for the baseline. Likewise, with Governor's Armor - the silver abdomen piece on it for example could be tinted gold, as opposed to regular golden chainmails. Perhaps there would be a way to do a similar thing for Serendine's Preservation/Last Stage Cuirass too? Which reminds me - considering that the above mentioned artifact-tier armors are already painted in-game, would it be very hard to also bring in their baselines? I know Grayface didn't feel like painting anything except the artifacts and relics, but it just so happens that most of them are identical to their mass-produced counterparts. Last edited by Xfing on Feb 23 2019, 20:28, edited 2 times in total. Added to the Bug Tracker. Almost missed this one! Arrgh. I'm kinda exhausted. Vinevi wrote: I wanted to make that custom UI because some or many people don't really like a theme or layout of the default UI in 8. That'd be interesting if you were to include the UI within the mod, if you feel like it deserves it. I will try to finish that one when I'll have time first, then might make some more with 7. I am hoping to sort things out and post GIMP project files so that if someone wishes to modify it they'd have source files. Look, Rodril, and GRAYFACE (you know, the guy that make the patches and is essentially reverse engineering the game!) who also helped to create this mod are MMMages at this point. I can assure you they will not only be able to make your UI style an optional thing, they will be able to script in a choice in the options menu and if selected also switch UIs on the fly when on the continents / and/or the path of MM7! Thanks for giving us the rights to use your awesome UI style. Mwahahah! Xfing wrote: BTW, obtaining more MM6 armor artifacts I've noticed that they are both tinted a bit differently. Great idea to differentiate them, though for example with the MM6 chainmails I saw an alternate paint where the red elements on the armor are blue instead. Maybe you could use that too/instead? It would be nice if both chainmails were actually different from their baseline chainmail template, while the untinted one with red accents could be used for the baseline. Likewise, with Governor's Armor - the silver abdomen piece on it for example could be tinted gold, as opposed to regular golden chainmails. Perhaps there would be a way to do a similar thing for Serendine's Preservation/Last Stage Cuirass too? Yeah, that alternate MM6 chainmail colour (blue instead of red) was done by me, only by using GIMP on an screenshot. Rodril and Grayface opted to use the Grayface's ones, which offered very little difference (i.e. almost none). Gimme a picture of an armour and I will try to differentiate (different tinting) it my way. Oh, and a random observation - most undead are immune to Dark, which means Control Undead will never work on them. Could there be an exception made for that spell so that it has a chance of working against dark immune monsters? Or has a pre-determined chance of working based on Dark skill and ignoring the target's Dark resist whatsoever? I mean the spell is more expensive than Enslave, but it's almost impossible to use it in practice. As for interfaces - I believe these should be switchable from the options menu, while the grid colors selectable for every character at the Adventurer's Inn (because if they were switchable at all times, people would just endlessly cycle through them for the fun of it during play - I know I would ). And I don't think it would be that easy to create MM7's, as that would require three separate ones, with all of which it would be very hard to reconcile the green character background The MM6 one looks sweet and it wouldn't hurt to have it in the game at all! Another bug btw - Antagarich's Judge gives you pretty much every quest item when you say "I lost it!" to him, indiscriminately. I believe he should only return quest items to you once you lose them while the quest is still not completed, otherwise not. Alice Hargreaves joined my NPCs once talking to her at Charles Quixote's Erathia residence. There are 3 hireable slots now (which is a bit OP - I've got two Bankers and an Instructor). I think they should be reduced to 2, as in vanilla. Last edited by Xfing on Feb 23 2019, 20:48, edited 3 times in total. Xfing wrote: Another bug btw - Antagarich's Judge gives you pretty much every quest item when you say "I lost it!" to him, indiscriminately. I believe he should only return quest items to you once you lose them while the quest is still not completed, otherwise not. Can confirm the Enroth Seer does this as well, I think they have gotten a bad case of Hoarders Syndrome... Or maybe they are dragons in disguise...? Another small one I noticed today: Humphrey in Castle Ironfist is REALLY concerned about his friend Slicker Quicktongue, to the point of asking me repeatedly to find a cure for him even after I have presented evidence he's a traitor, booted him from the council, murdered everyone in the Supreme Temple of Baa (including Quicktongue himself) and saved Enroth from the Kreegan presence. Even though he seems stuck on this line of dialogue he does let me use the royal yatch to go to Hermits Isle, as he should, he just never triggers any dialogue indicating I can. What I meant is that reputation matters in MM7 too, as it can greatly reduce shop prices. The system is nowhere near as extensive as in MM6, but it's still there and it does make a difference. In the Stone City, when you have a high reputation, the dwarves tolerate you longer when you trespass into their treasure room too (though not sure if that's not a bug actually). But yeah, in MM7 doing quests generally permanently increased your reputation, which led to price discounts. In MM8 the reputation system appeared to work the same mechanically be turned off entirely - quests no longer yielded any experience. What I've noticed is that this pretty much extends to MM7 and MM6 areas too. I think sticking with the simpler MM7 reputation system would be OK instead of returning the complicated MM6 system, which had the flaw of not being able to keep the top reputation, because it decreased on its own over time. I did like the interactions some peasants gave you based on your rep, that definitely added some immersion! Oh, and BTW - it does seem Celeste's magic shop carries weaker items than Bracada's. You could double check whether all the shops have proper quality tiers assigned to them. Statuettes in Antagarich disappear from their shrines after some time has passed. Strangely enough, those from Enroth never do. Last edited by Xfing on Feb 23 2019, 21:12, edited 2 times in total. Celeste has a weaker magic shop than Bracada in the original, so I think that's fine the way it is. Pit also has a worse shop than Deyja. Phobos wrote: Celeste has a weaker magic shop than Bracada in the original, so I think that's fine the way it is. Pit also has a worse shop than Deyja. Decks of Fate still don't tell you what they just boosted like Genie Lamps used to in MM7 vanilla.